My bucket list grew ever more last week when I happened upon a Facebook post regarding the most amazing view from an infinity pool you have ever seen. After a furious scuffle through hundreds of comments, I was finally able to locate where this particular hotel was… and just like that, Switzerland was added to my destinations I have to visit bucket list! The hotel that swung the deal may well be out of my price range, but that doesn’t mean I cannot check out the possibility of other options such as Switzerland houses for rent! There is no denying the Hotel Villa Honegg is a unique and superior place to lay your head, but it’s the position of the establishment that makes it even more breathtaking. Built in 1905 and modernised in 2011, the hotel is situated on te slopes of the Bürgenstock mountain and overlooks Lake Lucerne. The nearest airport is Zurich, which is an hour away, with Luzern train station a mere 24 km away, so very easy for travellers to get to. Once there, I defy you not to have your breath taken away by the spectacular views over the Lake Lucerne and beyond. The view is astounding, yet so is the price tag! A quick check on TripAdvisor and a one night stay will easily set you back over £1000 per night. Needless to say, it may be easier to stay elsewhere and call in for a quick drink to take in the view! So, now you know why I was so easily sold on visiting Switzerland, let’s take a look at what else there is to see and do in the extremely scenic country. 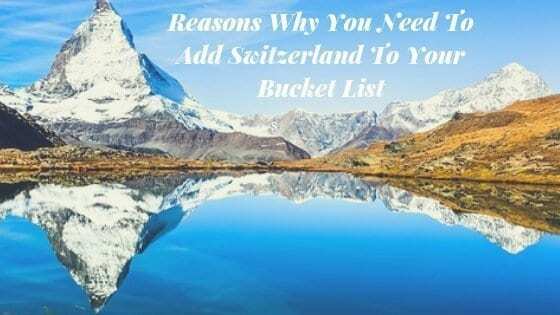 Known for its amazing chocolate, being totally neutral and a great tax haven for the wealthy and famous, Switzerland really does have more to offer than what we already know about it! The small, yet picturesque city of Bern dates back to the 12th century, with much of its medieval architecture still heavily preserved in the Altstadt district, more commonly referred to as the ‘Old Town’ which is now an UNESCO World Heritage site. Walk through the Bern Botanic Gardens along the River Aare, visit the Bear Park and watch Finn, Björk and their daughter Ursina happily play, fish, climb and relax in their 6,000 square metre home, right in the middle of the city! An absolute must see is the Child Eater of Bern – a 500 year old sculpture and fountain, yet noone knows why it is there, though there are many theories surrounding it. Bern does have its own airport, yet it is small with flights mainly from London. Zurich airport is only an hour away and offers more choice in terms of where to fly from and prices. For thrill seekers and adrenaline junkies… and mostly those who aren’t afraid of heights, this awe inspiring elevator is a must try! Created in 1905 and at the time made from wood and sheet metal, the 153 metre elevator ride used to take 3 minutes. After multiple overhauls, the Hammetschwand Elevator is nowadays made from metal and glass and shoots passengers up to the summit of Hammetschwand in less than a minute. Absolutely remarkable! At the summit, you are 1,332 metres above sea level where you can finally take in the breathtaking views of Lake Lucerne and the Alps. Another jaw dropping activity for thrill seekers is to cross the Trift Bridge, stretching high above the Swiss Alps and across a section of the Lake Triftsee, situated in Gadman. Originally constructed in 2004 to allow workers to cross, in 2009 it was replaced with a bridge made from sturdier materials and opened up to the public. Would you be able to cross the colossal 560 foot pedestrian bridge with a drop of 300 feet from the valley floor? I think I will leave that one for the more adventurous out there and look forward to their tales of that journey! No trip to Switzerland would be complete without spending time viewing and exploring the Alps – the highest and most extensive mountain range in Europe, which stretch over 1,200km, covering eight different countries. The highest peak of the Alps range located in Switzerland is the Dufourspitze (part of the Monte Rosa massif) at a staggering height of 4634 metres. Guided Alps treks are available that take you to the Dufourspitze summit, taking you on the expedition of a lifetime! Definitely a holiday you will not forget in a hurry! When your feet finally hit the ground, you need to pay a visit to the Swiss Chocolate Adventure based at the Swiss Museum of Transport in Luzern. Offering visitors and insight into the origins of chocolate right through from its discovery to how it is transported, the multimedia theme park offers chocoholic lovers the chance to learn more about their favourite treat… with the added bonus of tasting various creations at a Maître Chocolatier from Lindt. Nom nom nom! Apologies to Lindt, but don’t forget to return home from a holiday in Switzerland with a bar of Toblerone… originally created by Theodor Tobler and Emil Baumann in Bern in 1908! Have I convinced you to add Switzerland to your bucket list yet?